Raw honey and I fell into an accidental relationship several months ago. I was the grocery store and what do you know, there was this raw honey on sale for (get this) ONE DOLLAR! So I bought three jars. Because any honey on sale for a dollar is the honey for me. Now, I know that this may seem crazy, but I didn't realize it was raw honey. Nor did I care. It was a dollar. So I took the honey home, and then one day I opened it. And it was solid. I was mystified. Then I realized that it tasted so good. It was sweeter, but not overly sweet. It was in love. Raw honey and I were made for each other. Then one day, my small raw honey collection was dwindling and so I decided to look up the brand online to order some more. Imagine my shock when the stuff came up for $10 a jar! Holy honey balls, I had a case of sticker shock if ever there was one. And a little regret, if I am being perfectly honest, for not buying ALL the dollar raw honey when I had the chance. But my interest was also peaked in those moments....what in the heck was up with this raw honey? Sure, I knew it tasted better than the runny honey. I knew it was more solid, so obviously it was different. But why!? That was when I hopped online and did a little of my favorite nonscientific research which is basically me, hopping from website to website reading blurbs of stuff I googled. Fun stuff. What I found out was that raw honey is really healthy for me. That made me happy. Regular honey is heated (pasteurized) and so it loses a lot of its nutritional value. "They" also say that it can ward of infection and keep you from experiencing seasonal allergies because of the pollens and goodie raw stuff in it. That was when it dawned on me: I had been putting a teaspoon of raw honey in my tea daily and all winter.....I never got sick. My husband had gotten the stomach virus, and was horribly ill, and yet I never got it. People around me had colds, and coughs and all sorts of yuck...but I never once got it. I don't know if I can attribute this solely to the raw honey, but I'm totally hooked on it now. There is no other honey for me. In terms of taste and quality, it's better, and that would be enough for me on it's own. But there is something in back of my mind that tells me that it's keeping me healthy too. 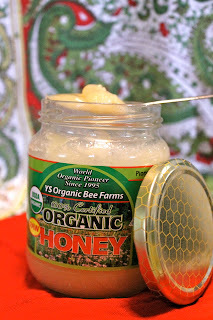 So tell me, do you eat raw honey, or are you curious about the quality of your other store bought honey?? have you noticed any health benefits as a result?!?! Share in the comments section below!